Rich and with a fiery flavour, this is a gourmet option for spicy meat fans. 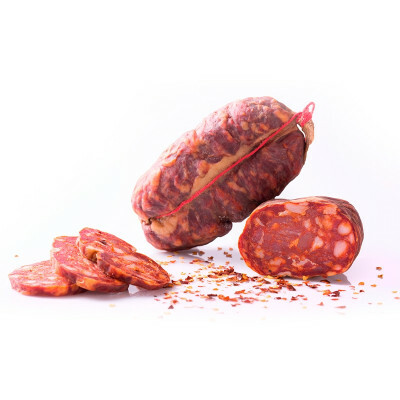 A coarse ground salame with rich ingredients, crisp flavour and a smooth, clean finish. It is made with high-quality meat from domestic pigs, which, according to tradition, is smoked with the fumes of oak firewood and seasoned raw. Lactose-free and gluten-free, this is a quality piece of meat that doesn't rely on the addition of anything but pure meat, herbs and spices. Spicy Soppressata is an excellent meat for sandwiches or on a pizza. Pork, Salt, Pepper, Spices, Natural Aroma, Natural Casing, additive : E300, E252. NO ALLERGENS. GLUTEN-FREE, LACTOSE-FREE, NO OGM.